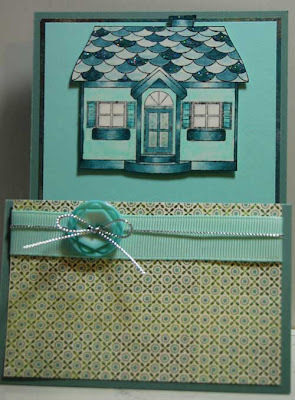 Andi here to share my card for our current challenge hosted by Melanie- flourishes! Now I have to admit I feel like I cheated as I chose paper that had flourishes hee hee. You can see them in the bottom left of the card and also below my sweet flying bird. I am obviously in need of some flourish dies ;). 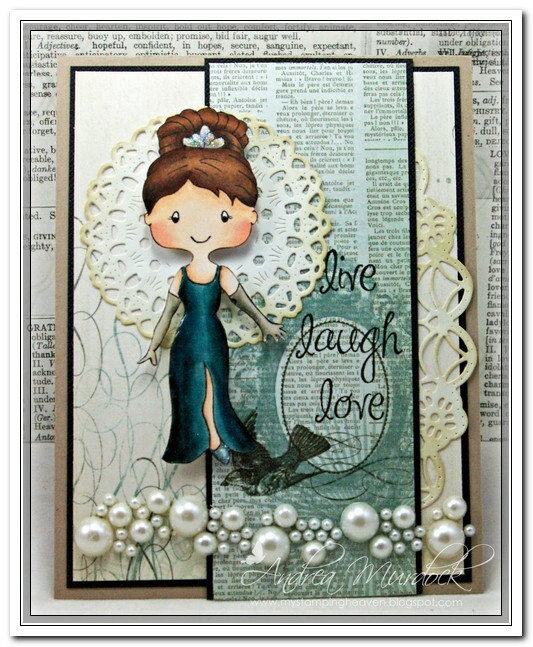 I used the lovely Lady Gilli on my card tonight and gave her a satin evening dress to go with my elegant card. I coloured her dress using the following copic colours- BG70, 72, 75, 78. I then added some crystal lacquer I had on hand to give it that satin sheen I just love. I had a satin shirt in the early 90's..it was in style then to be fair...and I just loved the way it felt against my skin and I like to imagine she is also enjoying the smooth silkiness of her evening dress. Well that's all for me today. I hope this helps to inspire you along with the other DT eye candy we have posted so that you play along with our current challenge. We would love for you to join us!! 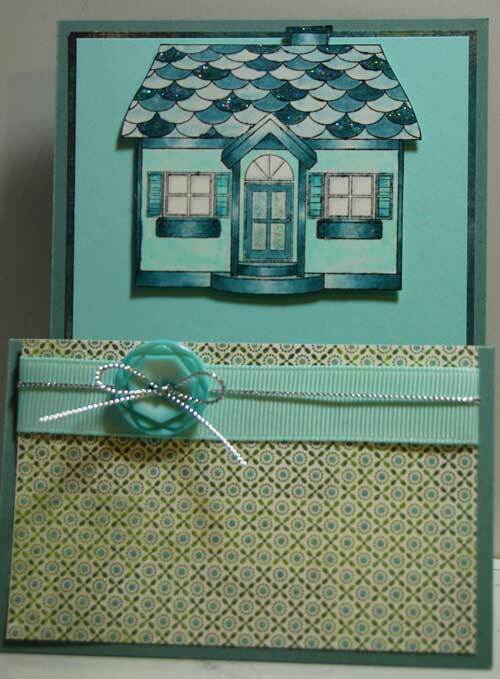 Today is my turn to show you a card for the flourish challenge over here at House of Gilli Challenge Blog! I used Balloon Gilli from Gilli Stamps and colored her with copics markers V17, V15, V12, G24, G21, G20, E337, E33, E53, E11, R20. I stiched my card using sew easy.. Love it! sooooo easy..lol Flowers are from recollections. Paper is from my stash! Cozying up with Gilli ! It’s Jo again. anaRy asked if I would mind filling in for Dionne for the next couple of challenges while she is moving. I am very happy to do so. The House of Gilli has some pretty fun challenges coming up for you. Are you excited? Did anyone go out shopping on “Black Friday”? Are you all rested up ready for the challenge? I sure hope so. This challenge is to create a project using flourishes within the project. I am using Cozy Gilli for my card. I have colored her with my copics. Can’t you just see her lounging on the rug in front of a roaring fire with a hot cup of coco? I cut the bottom of the card with a Paper Trey Ink die and added a little bit of a white gel pen stitch to make it show up a little more. My Flourishes were made with my Slice. I tried to match up some of the flourishes that are in the paper. I also added a chipboard star and some red hearts that I punched out to the area on the papers that had this design. I put them on foam dots to give the card a little dimension. The little “ Happy Holidays” stamp is a Studio G set I picked up at my local Walmart. The ribbon is some that I had in my collection. I sure hope that you have been checking out the other beautiful cards that the Gilli DT’s have been posting. They sure are inspiring. I hope that you will join in on this challenge and let your creative side shine. Thanks for stopping by, see you soon. Hello everyone. anaRy is in the house. Today is thanksgiving and I have to thank all of the Gilli DT for the spectacular work they do each challenge. They hold the house for me and I could not be more thankful ; ). Thanks to all of you that come to participate in our challenges..and all the winners that had to wait a bit so I could deliver their goodies (I am glad to say we are up to date!). Thanks for you patience and I hope you will be sharing your projects with us! Well moving on…My project to day is all about a cozy holiday! A new take in a holiday card . I used Gilli Cozy stamp and colored her with copic markers. LOL every time I see this stamp the first thing I notice is her little cute finger…LOLPapers from Authentique, DCWV and BoBunny. Ribbons from mike’s…my old stash lol. This was my first time using copic xpress and I love it! You should try! Signing off wishing you a cozy holiday season and see you all soon! For my card, I decided to use Fairy 2 Gilli, isn't she a beauty. I colored her with my Copics, using the Cryogen White card stock, I love using the Cryogen because it just sparkles. For my Flourishes, I used a die from Memory Box, Elegant Scrollwork and I just really love this die. Fairy 2 GILLI in shades of Blue ! my Monochromatic Challenge for the House of GILLI ! It have colored for the first time this cute Fairy 2 GILLI! Hope you like my shades of Blue card ! You can check more pictures at my BLOG ! isn't she a cutie. I have to tell ya, I showed my Mom this card last night and she really loves this image. I used my Copics to color her and hopefully she looks apple green :) A very dear friend gave me the ribbon and I thought it was perfect for this challenge. Good day everyone! Andi here to share my inspiration card for the current challenge. 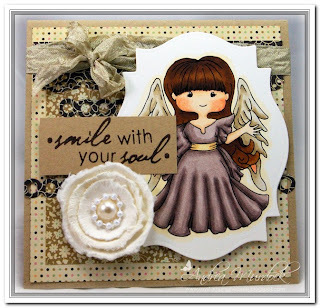 I used my adorable Angel Gilli that sweet Anary had stamped for me and included in my DT kit when I first started. I have to admit I haven't done many cards in this style so to keep it simple I only used my copics from the E colour family. Her dress was colored using E's I hadn't used before so I felt good finally being able to justify buying them tee hee! They were 70, 71, 74, 77. They look almost purple don't you think? What co ours do you think you will use to play along with our monochromatic challenge? It is my turn to show you a card for the Monochromatic Challenge over here at House of Gilli. Hum, it was quite difficult for me to decide which stamp I was gonna color this time but then I thought this one would be nice for the monochromatic challenege. Isn`t she a cutie?? I colored her using copic markers BG78, BF75, BG70, E11, E00, R20, BG10. I used the beaded oval nestie and the standard one to place my Gilli. I cut the bottom paper with Martha Stewart punch and then punched another piece of paper few butteflies to place near the flowers.. These background paper is from DCWV. I hope you like my card and come on over to play with us. Anary will give a gift bag to one lucky winner. It is an E party! More details over my blog! It’s Jo and I am back with my project as guest designer. This is my take on the monochromatic theme this week. I am using Angel Gilli for my card. Isn’t she pretty. This is the second time that I have used Angel Gilli and I love coloring here. anaRy has des igned her so that you can create pleats in her gown if you like. Coloring pleats and folds are one of my favorite types of coloring at the moment. I kept the card more on the simple side because I didn’t want to take away from Angel Gilli’s beauty. She is colored in the earth tones of copics. The papers are from My Minds Eye Lost and Found Christmas collection. I love this collection of papers it is muted but yet with very pretty designs. I have also added a few brown pearls and brown satin ribbon to finish it off. I hope that you will jump in and give the monochromatic challenge a try. I also want to take a moment to thank anaRy again for inviting me to be a guest designer. This has been fun. Eeek- I forgot to share my Gilli card for the recycling challenge! Andrea here and I can't believe I forgot to share my Gilli card for the recycled challenge- please forgive my addled brain lately lol. 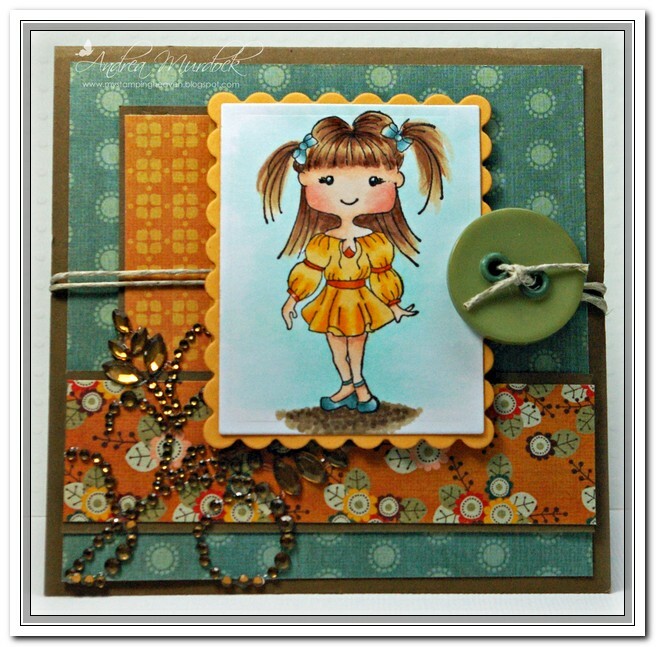 I had actually made this card up previously for the fall colour challenge but after seeing how it fit in with the recycling challenge it worked perfect here too! I had these leftover card pieces from a different card I had made and coloured up my cute!! 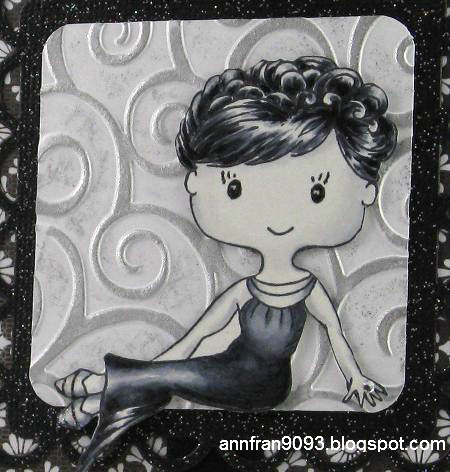 Lil Gilli girly stamp. She is so sweet and petite! I also re-used the button on my card from another craft that I was tossing out. Can't throw away a perfectly good button! I hope you had fun playing along with the recycling challenge and are now crafting to play along with our current Monochromatic challenge. that I got from AnaRy ! Isn't it cute ? See more details on this card at my BLOG ! Happy Thursday everyone. 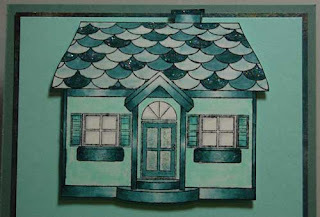 Isn't this a wonderful challenge "Recycle and Texture", hope you will join in. This is Jo Ham, anaRy recently asked me to be a guest designer this month for The House of Gilli. I have to tell you I was thrilled when she did. Gilli stamps are some of the cutest stamps. Oh and Gilli just recently celebrated her 1st birthday. anaRy designs Gilli to be used in many different ways. She draws the images so that you can add your own creativity like adding a sleeve length or drawing a design on a dress. The possibilities are endless. I think that is one of the things that first caught my eye. anaRy also is very passionate about the quality of the stamps and that they are made in the USA. The stamps are deeply etched so none of the extra ink where you don’t want it. I can’t say enough about anaRy, she is one of the sweetest people I have meet. I have been a crafter most of my life and I started stamping back in 1994 when someone gave me a card with a single image stamped and embossed on it. Boy I thought wow, I have to learn that. After lots of looking around, reading and traveling out of state to find stamps they started to catch on. I started with some stamps, markers and went on to stamp my first card. 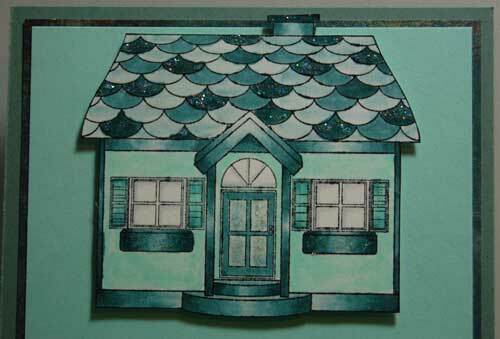 Then as it caught on more I got into embossing and coloring on different types of papers etc. We use to have two stamp store here but have since both went out of business like many. I started teaching at the stores and had so much fun teaching other the wonderful craft. Then the internet and stamping started taking off and that is how I found much of my supplies that and a local convention in Ocean City Maryland. I was introduced to Copic markers after taking a class in October of 2010 with the talented Suzanne Dean and I have not looked back since. Taking her class advise “practice, practice and practice some more”. I still feel like I learn something every day. I have meet so many wonderful people along my journey. Lady Gilli was invited to a party and was able to walk down the red carpet. The challenge for The House of Gilli is to use texture and something recycled. 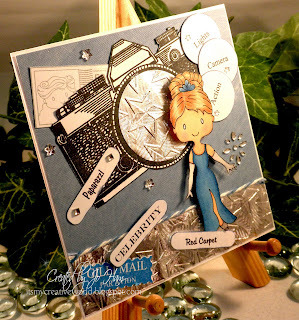 I created texture with my cuttlebug embossing folder for the layer at the bottom of the card and on the lenses of the camera. The recycled items were items that were used in a note that was sent to me. The bakers twine and the Gilli postage and par avion that were stamped on the note. Of course I had to add a little bling. A girl can never have too much bling when walking the red carpet. Have you been watching the site to see all the DT’s great inspiration for this challenge? Aren’t they fabulous? I hope that you will join in on the challenge.